, a traditional method of farming allows vegetation to recover from animal grazing whenever the farmers move on to another area. However, in the past 40 - 50 years the Masai's way of life and farming have been disrupted as a result of commercial pressures and government policies. The ecosystem has also started to suffer. Commercial farmers, encouraged by government policies, have moved into the best dry-season land and converted it to commercial agriculture. As savanna is converted into cropland, the natural vegetation is removed and the soil's nutrients are rapidly used up. When the Serengeti National Park was established in the 1950s to conserve wildlife and encourage tourism, human access to the park was restricted and the Masai were excluded from it. The Serengeti's population has expanded rapidly over the past 30 years. This has resulted in larger herds grazing the grassland and more trees being cut down for fuel. As vegetation is removed there is a risk of soil erosion. These interventions forced the nomadic Masai farmers onto marginal land. 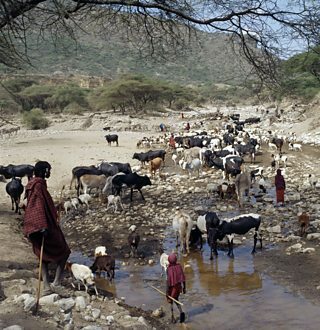 Their traditional pastoral migration patterns have been disrupted and they have been compelled to use smaller areas of land for their cattle. Overgrazing has been the inevitable result.
. Poachers are now killing around 150,000 wildebeest a year - and a dramatic fall in the wildebeest population will cause a knock-on effect throughout the ecosystem.